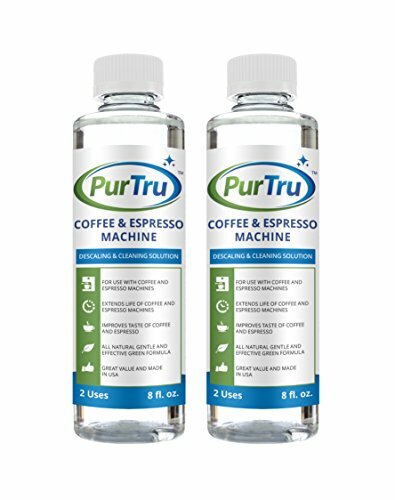 Coffee and Espresso Machine Descaling and Cleaning Solution by PurTru is the only all natural coffee and espresso machine cleaner and descaler on the market. Gentle and effective citric acid formulation extends life of coffee and espresso machines and improves taste of coffee and espresso. For best results follow the step by step instructions and descale machine every 1-3 months. Step 1 Prepare Coffee or Espresso Machine. Empty the water from the coffee or espresso machine water reservoir, remove water filter (if applicable) and set aside. Step 2 Add Descaling & Cleaning Solution. Pour half the bottle of PurTru solution into the coffee or espresso machine reservoir and fill with water. Step 3 Run Descaling & Cleaning Solution. Run one full reservoir with solution through your machine with no coffee. Step 4 Discard Remaining Mixture and Rinse. Discard any remaining mixture of solution and water from reservoir and fully rinse water reservoir. Step 5 Run Fresh Water Through Machine. Fill water reservoir with fresh water and run through machine 3 times. GENTLE AND EFFECTIVE GREEN FORMULA. The only all natural coffee and espresso machine cleaner and descaler on the market. Protect your family against harmful toxic chemicals found in other coffee machine cleaning and descaling solutions. Food grade citric acid formulation with no vinegar smell provides enough strength for descaling and cleaning while gentle enough to preserve vital mechanical parts. EXTENDS LIFE OF COFFEE AND ESPRESSO MACHINES. For best results use solution every 1 to 3 months to extend life of coffee and espresso machines. IMPROVES TASTE OF COFFEE AND ESPRESSO. Improves taste of freshly brewed and flavored coffee and espresso, cappuccino and lattes with no vinegar aftertaste. FOR USE WITH COFFEE AND ESPRESSO MACHINES. For use with descaling and cleaning Keurig K-Cup, Lavazza Capsules, Mr. Coffee Manual Coffee Maker, Braun Coffee Pot, Cuisinart Glass Carafe, Philips Saeco Vapore Espresso Pods, Bunn Coffee Brewer and all other drip coffee, espresso and single cup machines. GREAT VALUE AND MADE IN USA. Two uses in 8 oz. PET bottles made in USA and packaged in New Jersey. If you have any questions about this product by PurTru, contact us by completing and submitting the form below. If you are looking for a specif part number, please include it with your message.